Our high quality 75mm lapis lazulli globe is tediously constructed from multiple types of gems carefully crafted to the shape of multiple countries. These natural gems produces strong earth energy required for activation of earth element. 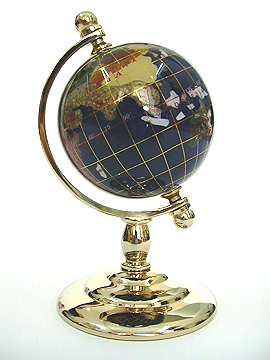 The longitudes and latitudes are gold wire electroplated. The splendid base is made from quality brass that is gold finished. This lapis globe would energize your mentor luck, business luck, networking, literary pursuits and recognition luck.